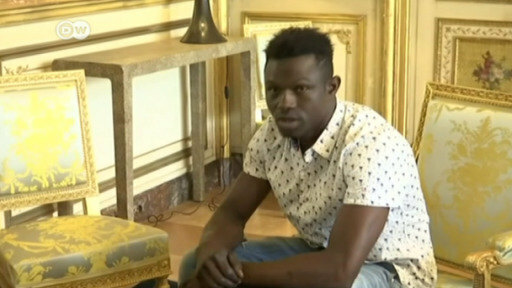 A migrant who climbed four floors up a facade to rescue a small child in Paris has been offered French citizenship after meeting President Macron. A video of his Spider-Man-like heroism went viral on social media. "I have also invited him to apply for naturalization. Because France is a state of mind, and Mr Gassama has shown with determination that he has it!" Macron added. The French president invited the 22-year-old to the Elysee Palace after a video went viral of the 22-year-old climbing Spider-Man-style up the building's facade on Saturday. "I was not thinking of anything. I went straight up", he told Macron. After receiving his medal Gassama said: "I'm pleased because it's the first time I've received a trophy like that." "I did it because it was a child," the newspaper quoted him as saying. "I climbed...Thank God I saved him." He later said that he was so overcome once he got inside the child's apartment, he began shaking and felt faint. Initial inquiries by French authorities found that the child's parents were not at home when the incident occurred. According to French news agency AFP, the boy's father is being questioned by police for leaving his child unattended. Mamoudou Gassama, a migrant from Mali who has been compared to Spiderman, will be made a French citizen after he scaled a building to rescue a child who was hanging from a ledge.